Automation results in more accurate, repeatable and high quality parts. Franklin Bronze Precision Components supervisory computer and robotic dipping systems create the foundation for a repeatable process. 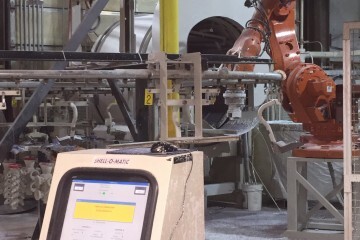 Installed by Shell-O-Matic, Inc., this computer-driven shelling system has increased capacity while also improving the uniformity of shells. 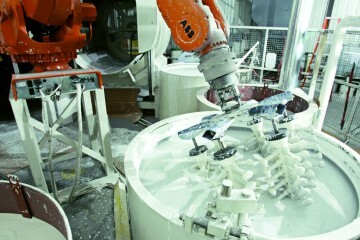 The supervisory computer system tracks casting throughput while ABB robotics drives the production process. 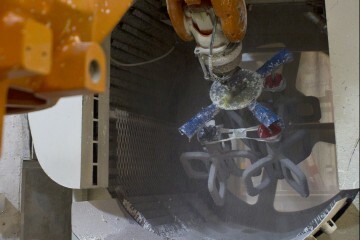 This automation results in increased investment casting part accuracy, quality, and repeatability. The shell dipping area is also equipped with three hand dipping slurry baths, three hand dipping fluidized sand beds, and automated drying racks. Hand dipping is offered for certain products that require this process due to part size/dimension.